This page lets you configure general settings for VPOP3 administration. 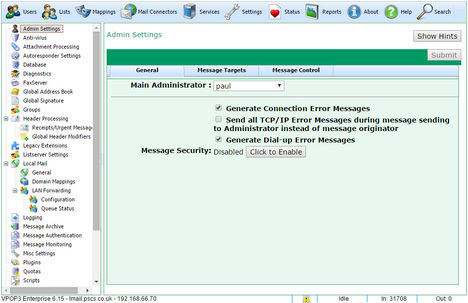 The Main Administrator is which VPOP3 user will receive error messages from VPOP3 when no other recipient has been specified (eg see the Message Targets tab). Note that this does not indicate which users can log into the VPOP3 settings as an administrator. That is configured in the user's settings, and is indicated in the Users list by a 'key' icon to the left of the account name. The Main Administrator cannot be an external email address, but must be a VPOP3 user. This user can have a forwarding or assistant address (or addresses) specified if you wish error messages to go to an external email address. However, note that if there is a problem with sending messages out, then VPOP3 will obviously not be able to send the error messages out either in that case. We strongly recommend that the Main Administrator is set to a user who will read their emails. It is very common for people to leave it set to the initial user (eg Postmaster) whose emails are never read, so users are not aware of any problems which are happening. The Generate Connection Error Messages option tells VPOP3 to generate error messages if it cannot connect to a remote mail server for some reason. Usually this will be checked, but you may wish to uncheck it if you want to minimize the number of error messages the Main Administrator receives. Note that if you do uncheck it, it may not be obvious when VPOP3 has a problem collecting or sending messages. The Send all TCP/IP Error Messages during message sending to Administrator instead of message originator option tells VPOP3 to send error messages to the Main Administrator instead of to the message originator, if VPOP3 has a network problem while sending a message. Choose this option depending on your requirements. If someone is reading the Main Administrator messages, and your users do not understand networking, then it may be more appropriate to check this box so that someone who can understand the error message receives it. Note that this option only affects networking error messages. If the error is something like an unknown recipient, then the error message will always go back to the original message sender. The Generate Dial-up Error Messages option only affects you if VPOP3 has a dial-up networking connection to the Internet. If it connects through a router, then this option is irrelevant. If this option is checked, then VPOP3 will generate an error email whenever it has a problem making a dial-up connection. The Message Security facility should be used with caution! 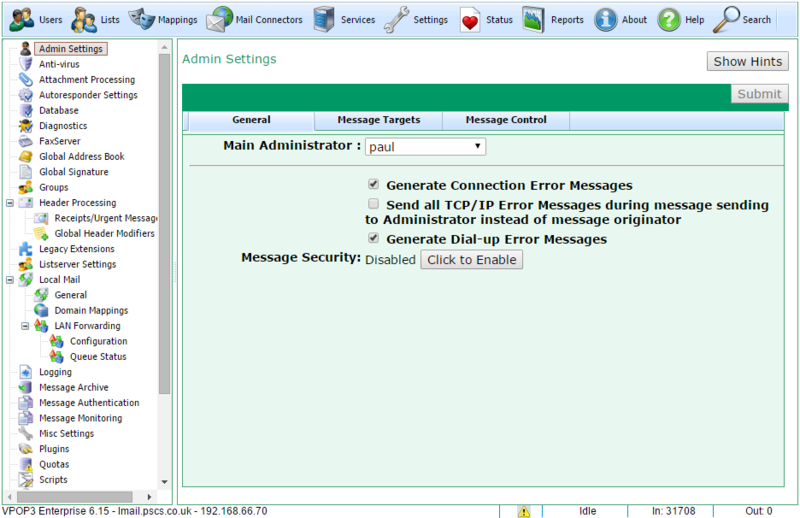 Message Security tells VPOP3 to disable any functionality which will allow an administrator to access message contents. Note that this does not just affect being able to view users' messages via the Users page, but also prevents them configuring Mappings, setting assistants, enabling Message Monitoring, etc etc. It greatly limits the features that the administrator can access! To enable message security, click the Click to Enable button on this page. You will be prompted to enter, and confirm a password which you are setting for Message Security. MAKE SURE YOU REMEMBER OR KEEP A COPY OF THIS PASSWORD. If you forget or lose the password, then you will have to contact VPOP3 technical support for help, and this will often require us to create a 'cracker' program for you to reset the password. This may take some time, and may be chargeable. Once you have set Message Security, then some features will become inaccessible to administrators, and you will have to enter the password to be able to use those features. Message Security is intended for the rare cases where people have to be made administrators but are not allowed to access other users' emails.